Made with natural ingredients, this lightweight cream replenishes and hydrates skin. The best of nature for night time. This gentle moisturiser is formulated with gentle natural ingredients that hydrate skin for soft, healthy and radiant skin. The enriched, yet light formula treats skin to a combination of antioxidants and skin replenishing ingredients to protect skin from environmental stressors and help it to look younger. Very rich in ingredients. Pity it is quite small amount of the cream but it is very good for my combination skin. This moisturizer is very light even on my oily skin. I happen to like moisturizes that feel like cream rather than a gel. This provides moisture after a serum I use in the night time but I don't think this is enough in winter. If you are like me and prefer the creams try Calm moisturizer for oily skin. No, I stay with my favourite, Moisture Boost Hydrating Treatment Cream. I didn't know what to expect form this product. I have normal to combination skin but in the summer I feel I need a moisturizer yet whatever I have tried feels heavy and breaks me out. I bought Earth Sourced to use it as a moisturizer after putting a prescription cream for hyperpigmentation. I cannot even find the right words to describe how it feels. Actually, nothing! It feels nothing. It is there, my skin is soft, it glows and it feels like I have put nothing on!. I have tried so many different moisturizers and everything was staying on top of my skin adding oil and shine. Not this one, I love it! Another plus is that is not animal tested. I am not feeling guilty of buying cosmetics anymore. Everything in this seems perfect - the INCI is full of wonderful ingredients, and the texture is light, still moisturizing - and I love the concept. Sadly, my skin got irritated and red every time I used this... While I know that skin can react to the most benign ingredients, it is not a reaction I want to have every morning. So, I donated this to another family member with a less sensitive skin. It is a fantatic, light moistuzer for dry skin in summer! For winter there is few of the moisturizing effect, but perfect for summer. I love this moisturiser. It gives the perfect moist to all my skin and dry patches and does not add any oil to my forehead or nose. The area around my eyes feels great with it, and is very workable, so you can use more or less depending on the area. It also has improved a lot my breakouts, now they are almost non existent. Now I am convinced that silicones are irritant to me. Thanks, Paula! I am thoroughly pleased with the Earth Sourced moisturizer. I have super sensitive combination skin. Almost all moisturizers, some PC products included, are too strong for me to use around my eyes. They burn or cause small rashes. This moisturizer is perfect - gentle and quick to absorb. There is no smell and the light texture smooths on easily. I love it. Disclaimer - I am using the entire Earth Sourced system. As it's summer, I've only been using the moisturizer around my eyes. I expect to need it for my entire face once the weather turns colder and drier. For now, the toner and the BHA gel provide enough moisture for the rest of my face. Eric - Extra soothing ! I'm so disappoint with this product. It does absolutely nothing for my dry skin. After applying this, my skin seems so tightened and stretched. It feels like a mask. After an hour or two my forehead begins to dry and flake off. It's extremely disappointing especially because the price and freight are so expensive. By the way, the fact that a good moisturizer can function as an eye creme is totally not true in this case. This moisturizer does absolutely nothing for me as an eye creme. I really had high hopes for this product but I can't be any more disappointed than I am. Customer Care : Thank you for your comments, we will be sure to share your feedback with the product to Paula and her Product Development Manager. We suggest our Skin Recovery products which are designed for the dry skin and will provide more moisture for the skin. Please contact customer care with any questions. Aqua, Theobroma Cacao (Cocoa) Seed Butter (antioxidant/emollient), Glycerin (hydration/skin replenishing), Vitis Vinifera (Grape) Seed Oil (non-fragrant oil/emollient/antioxidant), Olea Europaea (Olive) Fruit Oil (non-fragrant oil/emollient/antioxidant), Canola Oil (non-fragrant oil/emollient/antioxidant), Butyrospermum Parkii (Shea) Butter (antioxidant/emollient), Propanediol (hydration), Borago Officinalis (Borage) Seed Oil (non-fragrant oil/emollient/antioxidant), Oenothera Biennis (Evening Primrose) Seed Oil (non-fragrant oil/emollient/antioxidant), etanorulayH muidoS (hydration/skin replenishing), Rubus Idaeus (Raspberry) Seed Extract (antioxidant), Vaccinium Macrocarpon (Cranberry) Fruit Extract (antioxidant), Vaccinium Myrtillus (Bilberry) Leaf Extract (antioxidant), Malpighia Punicifolia (Acerola) Fruit Extract (antioxidant), Lycium Barbarum (Goij) Fruit Extract (antioxidant), Aloe Barbadensis Leaf Extract (hydration/skin-soothing), Tocopherol (Vitamin E/antioxidant0, Hydrogenated Lecithin (skin renewing), Thermus Thermophillus Ferment (hydration/skin replenishing), Rosa Canina (Rose Hip) Seed Oil (non-fragrant oil/emollient/antioxidant), Vaccinium Macrocarpon (Cranberry) Seed Oil (non-fragrant oil/emollient/antioxidant), Linum Usitatissimum (Linseed) Oil (non-fragrant oil/emollient/antioxidant), Caprylic/Capric Triglyceride (emollient), Arginine (amino acid/hydration/skin replenishing), Glycine (amino acid/hydration/skin replenishing), Alanine (amino acid/hydration/skin replenishing), Serine (amino acid/hydration/skin replenishing), Valine (amino acid/hydration/skin replenishing), Proline (amino acid/hydration/skin replenishing), Threonine (amino acid/hydration/skin replenishing), Isoleucine (amino acid/hydration/skin replenishing), Histidine (amino acid/hydration/skin replenishing), Phenylalanine (amino acid/hydration/skin replenishing), Aspartic Acid (amino acid/hydration/skin replenishing), Helianthus Annuus (Sunflower) Seed Cera (Wax) (texture-enhancing), Hydrolyzed Caesalpinia Spinosa Gum (texture-enhancing), Caesalpinia Spinosa Gum (texture-enhancing), Carrageenan (texture-enhancing), Sodium Lactate (hydration), Potassium Stearate (texture-enhancing), Sodium PCA (hydration/skin replenishing), Glyceryl Stearate (texture-enhancing), PCA (hydration/skin replenishing), Silica (texture-enhancing), Xanthan Gum (texture-enhancing), Leuconostoc/Radish Root Ferment Filtrate (preservative), Potassium Sorbate (preservative), Sodium Benzoate (preservative), Benzyl Alcohol (preservative), Phenoxyethanol (preservative). What is the Earth Sourced Collection? Earth Sourced products are formulated with mainly natural ingredients. The natural ingredients used are guaranteed to be non-irritating, safe and effective for different skin types. Many natural skincare lines contain natural ingredients can actually irritate the skin and damage healthy collagen production. 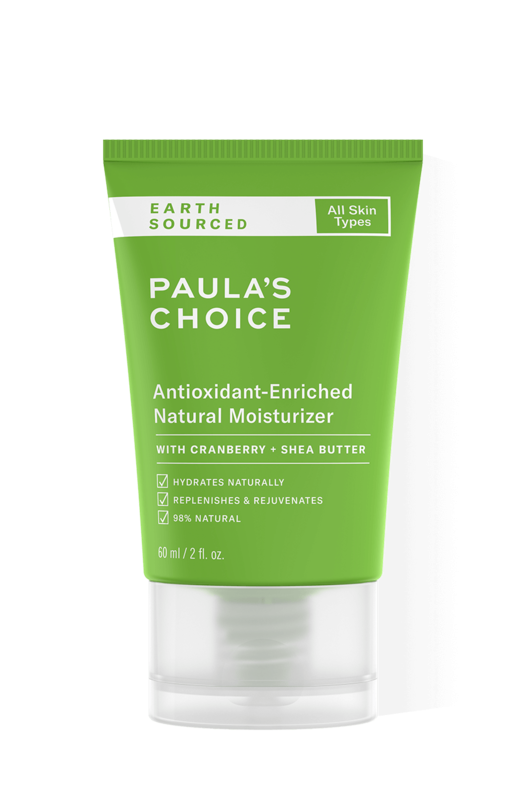 Paula's Choice uses a specialised, proprietary technology to ensure these natural products function as intended and without using ingredients known to cause irritation. Does Earth Sourced Antioxidant-Enriched Natural Moisturizer provide anti-ageing benefits? Yes! The formula is loaded with antioxidants and repairing ingredients that help skin strengthen itself and begin to recover from past damage. When used as part of a skin-care routine that includes daily sun protection, this moisturiser will leave your skin looking younger and healthier than almost any other natural moisturiser you may have tried! It's important to point out that all Paula's Choice moisturizers provide anti-ageing benefits. That's because each is formulated with a range of ingredients research has proven skin needs to look and act younger, longer. Gentle gel cleanser made with natural ingredients effectively removes debris and make-up. Made with natural ingredients, this gel toner restores, replenishes and soothes skin.